LOS ANGELES (Reuters) - In the final season of Netflix Inc's "House of Cards," Frank Underwood is physically gone, having died unexpectedly in his sleep. But the ghost of the win-at-all-costs politician played by Kevin Spacey haunts his wife and her young presidency. Writers of the acclaimed drama had to rework the story after Spacey was accused of sexual misconduct a year ago and dropped from the show that made Netflix a player in premium television. The ending of the Underwoods' story, which the producers called a "season of reckoning," will be available on Netflix on Nov. 2. 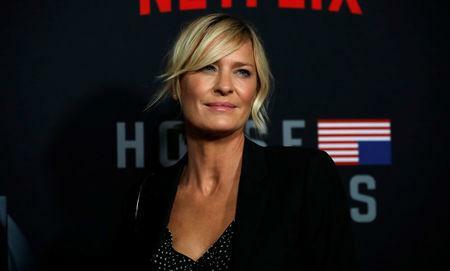 At last season's conclusion, Frank's statuesque wife Claire, played by Robin Wright, looked into the camera and declared "my turn" as the power shifted and she became the first female U.S. president. After Spacey's departure, executive producers and writers Frank Pugliese and Melissa James Gibson said everyone involved in the show felt they wanted to go ahead with a sixth and final season. "What would it have been like to actually rob her turn?" Pugliese said in an interview. "It seemed like an impossible, unacceptable way to end it that way." The eight new episodes do not dance around Frank's absence. The first episode reveals early on that he died in bed but makes the cause of his death the subject of an ongoing mystery. "It would have felt really dishonest to try and erase him essentially as a character," Gibson said. "I think that wouldn't have honored the seeds of the show." Spacey was nominated for five Emmys for his "House of Cards" role. But last November, Netflix quickly cut ties with the actor after allegations of sexual misconduct surfaced. He has been accused by more than 20 men and has said nothing publicly about the allegations since an apology to the first accuser in October 2017. Throughout the final "House of Cards" season, Claire is forced to constantly grapple with her late husband's deals and the compromises she made with him. "She is trying to carve out her own path and in doing so she has the opportunity and obligation to really face herself in a profound way," Gibson said. "The circumstances became opportunities that I hope this season fulfills," Pugliese said.